Whether it’s regarding the Porsche 944 or the Porsche Panamera , if news breaks out on Porsches, we are interested and Porsche have announced that they have a new member to add to the family of highly sought after GT performance models; the Porsche Cayman GT4. This is the first time that the Cayman has received the GT treatment and it has got a fair few Porsche fans which is unsurprising when you consider that the Cayman is accessible to a much wider market that than the majority of Porsches thanks to its relatively cheap price tag. It is already making a bang and a statement of intent, by razzing around the Nurburgring and managing a lap time of 7 minutes 40 seconds, which puts it at the top of the class when it comes to the Cayman’s market segment. The engine, chassis, brakes and aerodynamic design of the Cayman GT4 are configured for maximum driving dynamics; yet the top model still retains the versatility and everyday utility that are typical of a Porsche. The engine is based on the 911 Carrera S engine, it is mid mounted and can create 385 hp thanks to a 3.8 litre flat-six engine. 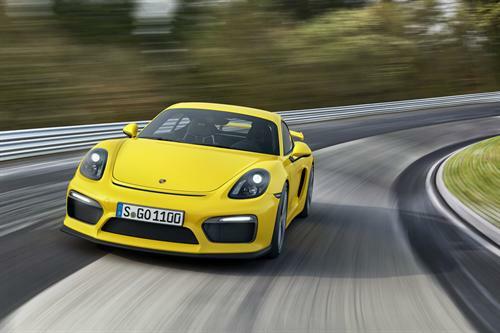 In terms of performance the Porsche Cayman GT4 can do 0 to 62 mph in 4.4 seconds, and it can reach a top speed of 183 mph. The body of the GT4 is fixed lower than the standard Cayman and the chassis has been tweaked using their knowledge from the 911 GT3. Interested in getting yourself one of these bad boys then head over to BuyYourPorsche for more details.